Interesting, but when you complete the "test puzzle" it does not return the "Congratulations ... " msg confirming the correct solution . With respect to the Shift + left/right arrow keys it does not apparently work on my keyboard, after pressing, i.e., Shift + left arrow key it simply removes the cursor (orange) indicator leaving the cell in white and "after" this no operator can be entered, no additional action shown. Thanks for testing, can you send a screenshot of the completed puzzle? Are you able to enter guesses in cells by using the shift key? Guesses are correctly entered with the shift key, this feature works well on my keyboard, though anyway I never use guesses, I use to place the candidates anywhere in the cage, one number per cell. The screenshot shot I obtain in this no-op just says the usual "(Note that you have already solved this puzzle)", which in one hand is logical being a yesterday's solved puzzle, but I was waiting a "new" "Congrats" msg for this experimental puzzle. In your case, had you solved the puzzle yesterday? or, you have solved it for the first time today as no-op?, that could make the difference. It looks like you have to enter all the operators as well as the numbers in order for the puzzle to be considered solved. I did this, and then I had to re-enter one of the numbers in the cage at [1,d-e] in order for it to turn green. solutions). No examples/proof yet though..
Last edited by pnm on Sat May 25, 2013 3:04 pm, edited 1 time in total. after you change an operator, will fix..
First: Now the Shift + right arrow produces the operators on my keyboard, holding the Shift key and pressing the right arrow 1, 2, 3 or 4 times to obtain "+", "-", "x" and ":"; but when holding Shift + left arrow 1, 2 and 3 times it returns to "-", "+" and "no-op" skipping the "x", that is, from the division operator jumps to the subtraction skipping the multiplication ???. Apart of this, perhaps the instructions given below the diagram would be more clear in this way " ... for a cage holding the Shift key and pressing the required number of times the right/left arrow keys." Second: I am having the same experience as mparisi so to get the "Congrats" msg it is necessary to enter all operators and then re-enter one of the numbers in any cage. Third: Observing the diagram (reproduced here) the cages "5x", "3x" and "2x" could have been "5:", "3:" and "2:", nine combinations with these operators, so not unique solution with respect to operators (unique with respect to the position of numbers in the grid) and in fact any of those possibilities is accepted as good and the "Congrats" msg shown, this is OK as already commented (for the moment) though the ideal situation is perhaps the total unicity so that all puzzlers have the same solution. Four: Now the May 23, 2013 6x6 medium is "locked" to the no-op puzzle so if you visit this date and puzzle you directly get the experimental puzzle and not the original one . Good catch, thanks, fixed now. That has been fixed now too. I think I prefer that: you're only required to set the cages to operators that work. Very interesting and a little bit more difficult, in my opinion, though being a 5x5. 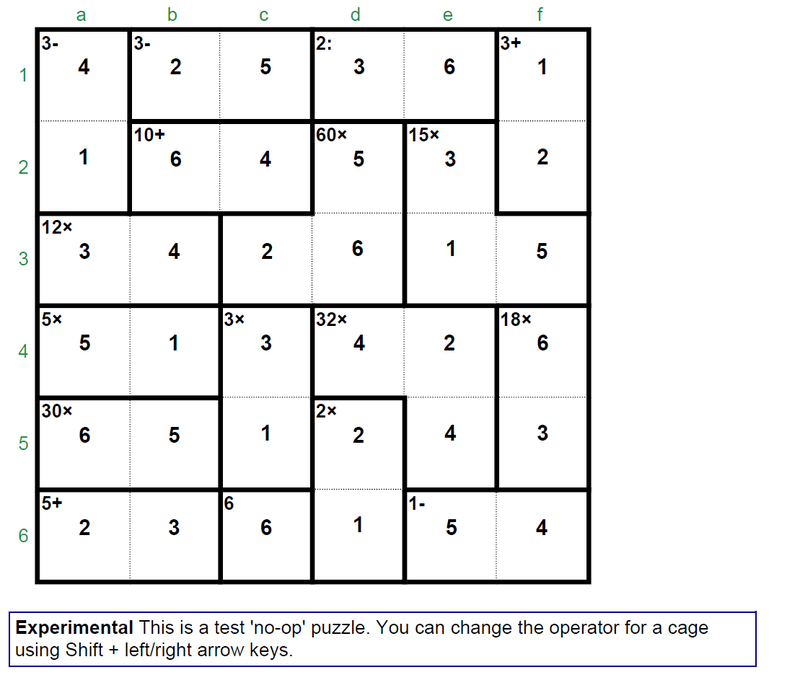 But it seems that the switch has not "swapped" to the May 21, 2013, 5x5 difficult, now there are two no-op puzzles, the previous May 23, 6x6 and this one.